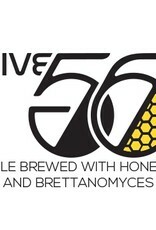 "Hive 56 is a dark sour ale aged with honey in an oak foudre for eighteen months. The beer is deep mahogany in color with aromas of strawberries, lemon, and tropical fruit; notes of dark chocolate, raspberries, and figs present themselves upon the first sip, followed by a lingering tartness. We brew this beer with a blend of dark Munich malt, chocolate wheat, midnight wheat, and roasted barley, and hop with Cascade and Northern Brewer. 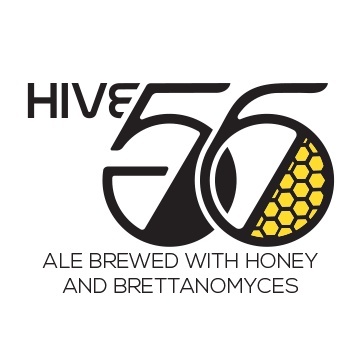 Hive 56 undergoes initial fermentation with our house yeast; we then transfer the beer to a foudre with Brettanomyces bruxellensis and fresh honey from our Allagash beehives. Over the course of the next 18 months, the Brettanomyces transforms the honey, resulting in a beer with bold, roasty flavors, and a hint of tropical fruit."